Spent fuel inspections not only increase safety, but done right, also help minimize outage downtime, resulting in cost savings for plant operators. To this end, Diakont has developed the Fuel Assembly Inspection System to maximize the efficiency of this process. 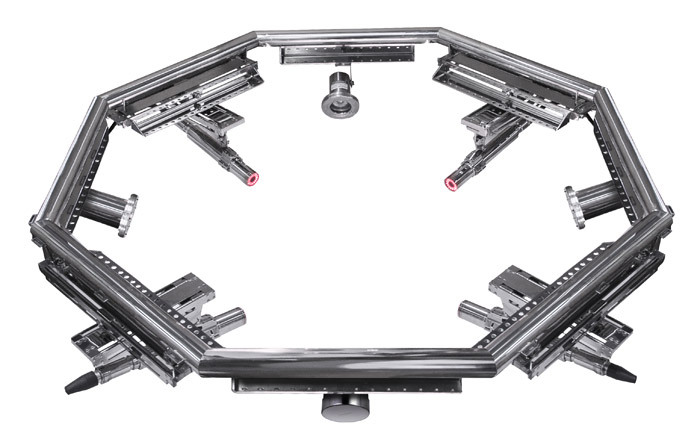 Our Fuel Assembly Inspection System is comprised of four D40 cameras installed on a ring assembly with integrated auxiliary high-power lighting. This configuration speeds up inspection time up to three times as fast as single-camera systems. During routine fuel transfer from the refueling cavity to the spent fuel pool, Diakont’s Fuel Inspection System is temporarily installed in the transfer canal near the upender in the spent fuel building. The fixture is positioned directly above the upender, with each camera oriented perpendicular to the four faces of the fuel assembly. The inspection is performed while the fuel is being extracted from the upender, with zero impact (in added time or motion) to the fuel transfer operation. One of the four cameras is installed on a pan/tilt mount for remote manipulation and viewing of the bottom nozzle. Diakont’s D40 camera systems are the proven industry standard for radiation-tolerant, high-quality visual inspection equipment, making them the ideal solution for fuel inspection applications. Designed and manufactured to stringent quality standards, the D40’s innovative technology, versatility, and rugged durability have led to the deployment of close to 1000 D40 systems to date in Russia, the U.S., Japan, France, Finland, and other countries.